In the first season of the TV-series "Lost" year 2004 character Hurley wins 114 million dollars with "cursed" numbers. Bulgarian lotto machine gives exactly the same numbers on 6th and on 10th of September 2009, four of them are the same as in "Lost". Almost 25.000 people use Hurley's row in American Mega Millions Lotto on 6th of January 2011. They get four right and earn 150 dollars each. Lotto is the government conspiracy, which gives is hope when it's almost gone to wake up every morning to earn money to someone else. 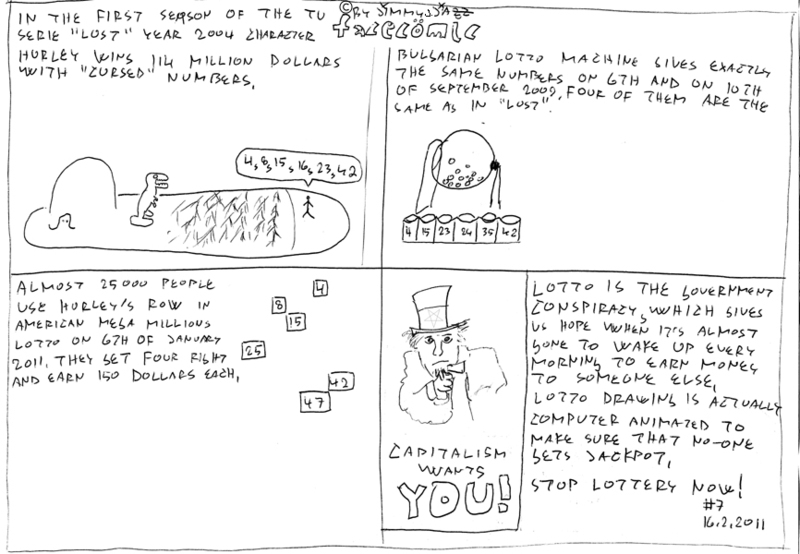 Lotto drawing is actually computer animated to make sure that no-one gets jackpot.